Attorneys for President Donald Trump appeared in court Tuesday to argue against claims that the president violated a constitutional clause that prohibits elected officials from doing business with foreign governments saying that attorneys general from Maryland and Washington, D.C . don’t have the authority to sue him. The case, which is being brought jointly by the two attorneys general, argues that Trump violated the U.S. Constitution's foreign emoluments clauses by benefiting from the patronage of foreign dignitaries at the Trump International Hotel, which is located just a few blocks away from the White House. The hotel is at the center of a protracted legal battle as opponents have argued that foreign officials who patronize Trump's D.C. property may be currying favor with the president. The Constitution's two so-called emoluments clauses prohibit federal officials from accepting gifts or profiting from a foreign or domestic government. Tuesday's case is one of three such cases brought against the president related to this issue. The attorneys from the Department of Justice representing President Trump on Tuesday argued that there is no authority to sue the president in his official capacity because of the office he holds – saying he is unique and immune from the matter. “The president is unique in the Constitutional structure” Justice Department attorney Hashim Moopan said Tuesday in appellate court in Richmond, Va. citing “fundamental defects” in the case. “What do you do then? Where’s the check on the president?” the judge asked. When asked by Judge Marvin Quattlebaum if there’s anything the president can do to address these concerns over emoluments, Moopan replied he would need to resign from office. “The only thing he can do would be to resign from office….or divest his financial interests,” Moopan said. Attorneys arguing on behalf of Washington D.C. and Maryland disputed the notion that you can’t sue the president but had a tougher time answering when pressed what relief they thought was appropriate for the issue – if it was putting the money into a blind trust or full divestiture. Solicitor General Loren AliKhan said it’s “hard to say” at this point what solves it because it depends on the facts on the ground. “I don’t think it’s hard to say,” Judge Paul Niemeyer shot back. "You filed the lawsuit and you don't even know what real-world relief would satisfy. You seem to be ducking the question" he said. “Divestment is the clearest option,” AliKhan said. 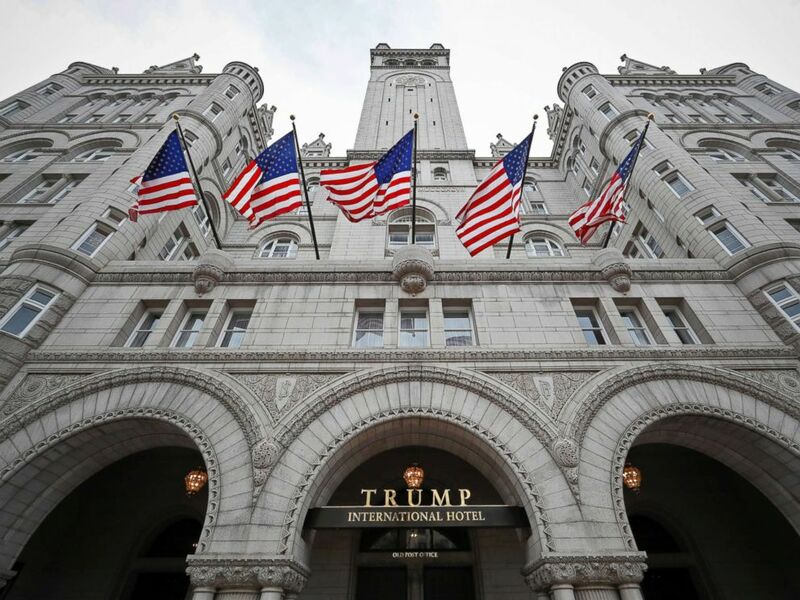 Attorneys for the president argued on Tuesday, as they have in the past, that foreign dignitaries simply "prefer the Trump brand" and are not seeking special treatment with the president when visiting the Trump Hotel. On any given night, patrons walking through the lobby could chance upon Trump insiders hosting social events, or could even spot the president himself dropping in for dinner unannounced. The hotel also sees its fair share of foreign government officials. Dignitaries from Bahrain, Azerbaijan, Nigeria and South Korea have all been spotted in the hotel, and just last month the hotel hosted the Kuwaiti embassy's national gala. "We're very confident that we can prove that the President of the United States, a major owner of the Trump Hotel, is, in fact, receiving moneys from foreign countries who are quite motivated to show the president favor," Karl Racine, the Washington D.C. attorney general told ABC News prior to Tuesday's hearing. "So that the president might be more inclined to tilt in a direction that they like." A photo from Dec. 21, 2016, of the Trump International Hotel on Pennsylvania Avenue in Washington, D.C. Attorneys for the president asked that one of the other cases, brought by members of Congress, be dismissed. A judge in that case found that the members of Congress have standing for the suit, and is currently considering other elements of the president's motion to dismiss. The other emoluments case, brought by a government watchdog group, was dismissed and is currently being appealed. Attorneys for the president attempted to have the Maryland and D.C. lawsuit dismissed earlier this year, but a judge in Maryland ruled in July that the case could proceed, citing in his decision that the Maryland and D.C. attorneys general had "convincingly argued that the term 'emolument' ... means any 'profit,' 'gain,' or 'advantage' and that accordingly, they have stated claims to the effect that the president, in certain instances, has violated both the foreign and domestic clause." The outcome of the case will depend largely on how the term "emolument" comes to be defined. This is open for debate however, as emoluments cases are exceptionally rare, and one has never gone to trial in the United States. Earlier this year, the president's legal team argued for a more narrowly tailored interpretation of the emoluments clause, stating that payments by foreign dignitaries to the Trump Hotel should not be considered emoluments because they don't relate to his work as president. But the judge who allowed the case to proceed sided with the Maryland and D.C. attorneys generals' broader definition of the term, who argued that an emolument is anything of value, including payments to the president's companies. "No Americans should ever have to question whether a decision, a priority, or a policy approach that the President is taking has been influenced by his receipt of foreign money that goes right into his pocket," Racine said. "That's why we're bringing this lawsuit." The president's adult sons running the business have bristled at the charge they are profiting off the presidency. "Unlike any other luxury hospitality company, we do not market to or solicit foreign government business," said Eric Trump, an executive vice president of the Trump Organization. "In fact, we go to great lengths to discourage foreign government patronage at our properties." Potential violations of the emoluments clause have also caught the attention of some members of Congress with oversight power. Rep. Elijah Cummings, the chairman of the House Oversight committee, told ABC News that he believes that Trump is personally profiting from the presidency. "Every time he gets a check. Every time you have a situation where -- people say -- go to his hotel -- spend money there, and it appears that they are trying to either curry favor or they're trying to get something," Cummings said. "That, to me, is a violation." During Tuesday's arguments before an appellate judge in Richmond, Virginia, attorneys for the president will challenge that ruling, arguing as they have in the past that foreign dignitaries simply "prefer the Trump brand" and are not currying favor with the president when patronizing the Trump Hotel. In February, the Trump Organization donated $191,000 to the United States Treasury, a figure the organization said reflects its profits form doing business with foreign governments during the 2018 fiscal year. Before his inauguration, Trump pledged to donate all profits from foreign government patrons at his hotels and other properties to the U.S. Treasury. He similarly donated $151,000 the previous year.